(Nanowerk News) As part of a project demonstrating new 3-D printing techniques, Princeton researchers have embedded tiny light-emitting diodes into a standard contact lens, allowing the device to project beams of colored light. Michael McAlpine, the lead researcher, cautioned that the lens is not designed for actual use — for one, it requires an external power supply. Instead, he said the team created the device to demonstrate the ability to "3-D print" electronics into complex shapes and materials (read our Nanowerk Spotlight on this work: "Fully 3D-printed quantum dot LEDs"). "This shows that we can use 3-D printing to create complex electronics including semiconductors," said McAlpine, an assistant professor of mechanical and aerospace engineering. "We were able to 3-D print an entire device, in this case an LED." Michael McAlpine, an assistant professor of mechanical and aerospace engineering at Princeton, is leading a research team that uses 3-D printing to create complex electronics devices such as this light-emitting diode printed in a plastic contact lens. 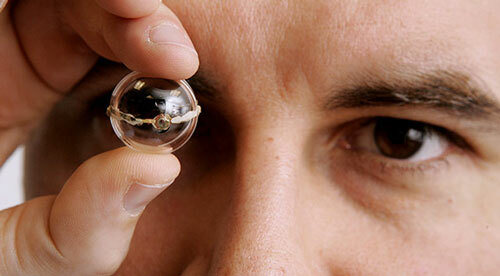 The hard contact lens is made of plastic. The researchers used tiny crystals, called quantum dots, to create the LEDs that generated the colored light. Different size dots can be used to generate various colors. "We used the quantum dots as an ink," McAlpine said. "We were able to generate two different colors, orange and green." Yong Lin Kong, a researcher on both projects, said the bionic ear presented a different type of challenge. "The main focus of the bionic ear project was to demonstrate the merger of electronics and biological materials," said Kong, a graduate student in mechanical and aerospace engineering. Kong, the lead author of the Oct. 31 paper describing the current work in the journal Nano Letters ("3D Printed Quantum Dot Light-Emitting Diodes"), said that the contact lens project, on the other hand, involved the printing of active electronics using diverse materials. The materials were often mechanically, chemically or thermally incompatible — for example, using heat to shape one material could inadvertently destroy another material in close proximity. The team had to find ways to handle these incompatibilities and also had to develop new methods to print electronics, rather than use the techniques commonly used in the electronics industry. "For example, it is not trivial to pattern a thin and uniform coating of nanoparticles and polymers without the involvement of conventional microfabrication techniques, yet the thickness and uniformity of the printed films are two of the critical parameters that determine the performance and yield of the printed active device," Kong said. To solve these interdisciplinary challenges, the researchers collaborated with Ian Tamargo, who graduated this year with a bachelor's degree in chemistry; Hyoungsoo Kim, a postdoctoral research associate and fluid dynamics expert in the mechanical and aerospace engineering department; and Barry Rand, an assistant professor of electrical engineering and the Andlinger Center for Energy and the Environment. McAlpine said that one of 3-D printing's greatest strengths is its ability to create electronics in complex forms. Unlike traditional electronics manufacturing, which builds circuits in flat assemblies and then stacks them into three dimensions, 3-D printers can create vertical structures as easily as horizontal ones. "In this case, we had a cube of LEDs," he said. "Some of the wiring was vertical and some was horizontal." To conduct the research, the team built a new type of 3-D printer that McAlpine described as "somewhere between off-the-shelf and really fancy." Dan Steingart, an assistant professor of mechanical and aerospace engineering and the Andlinger Center, helped design and build the new printer, which McAlpine estimated cost in the neighborhood of $20,000. Prime uses for 3-D printing are situations that demand flexibility and that need to be tailored to a specific use. For example, conventional manufacturing techniques are not practical for medical devices that need to be fit to a patient's particular shape or devices that require the blending of unusual materials in customized ways. "Trying to print a cellphone is probably not the way to go," McAlpine said. "It is customization that gives the power to 3-D printing." In this case, the researchers were able to custom 3-D print electronics on a contact lens by first scanning the lens, and feeding the geometric information back into the printer. This allowed for conformal 3-D printing of an LED on the contact lens.